about this book: This book is for those who are feeling the effects of the break-up of a close relationship and are wondering what happened and why, what life has in store now, as well as how to move on with their life. My own divorce completely rocked my world, and I struggled to survive it. For me, the break-up came out of the blue. I was blindsided by what was happening to me, and the shock reverberated for years. I felt alone, lost and afraid. I honestly thought my life was over. I couldn't have been more wrong. When I started to come out of the worst and to see hope emerging, I decided I didn't want anyone to experience what I had without having some easily accessible guidance to show them the way out, and to be able to do it a whole lot faster than I had! I wanted to reassure others experiencing similar emotional pain they are not alone, that break-up is not the apocalypse they maybe first thought it was, and that your life isn't finished even if it feels like it at the time. If you are suffering as a result of a relationship breakup, by following the 5 keys in the book, you can not only survive but genuinely thrive and come out the other side with your life much more aligned to who you truly are. To experience this is not only a joy it is also a reassurance to know that patterns from the past need not be repeated and life can move forward with purpose. This book is the result of not only my particular journey but also 20 plus years of research and personal development work. I have a sociology degree and many qualifications in various areas such as counselling, personal and spiritual development, nutrition, therapies etc. In my own practice, I have worked with hundreds of clients over the years, helping them move on to where they want to be. But most important is that I know now how to solve my problems, and I want to show you how you can resolve yours too and do it quickly. I've filled the book with guidance, examples, tools, insights and good old plain speaking from the heart to help you move forward and create the life you choose, one that sings to your greatest desires and fills you with joy. When you know what to do and how to see it through, you will find that your whole life will change. You will feel more confident and have hope for your future. You will be able to leave the past where it belongs, make your dreams for the future a reality, and skip around any stumbling blocks that threaten to prevent that happening. 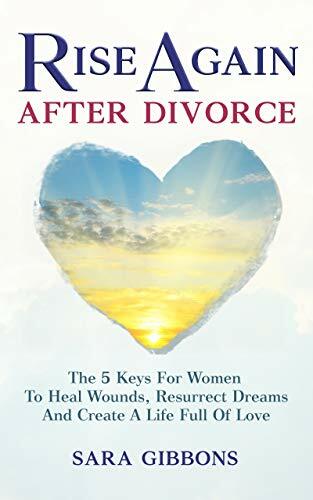 'Rise Again After Divorce' is for you whether you're feeling helpless about your divorce, want some tips to help understand more and make further improvements, or are most definitely ready to leave the past firmly where it belongs and move on in style. • 'Seldom have I a read a book from cover to cover in one sitting; but this was one of them.